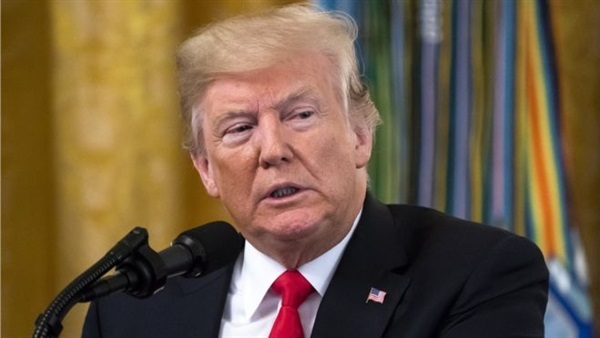 President Donald Trump praised the US and its allies for progress made in the fight against ISIS (Daesh) in a speech that failed to discuss the diplomatic and policy implications of his sudden decision to pull US troops from Syria, CNN reported. In a speech to the Global Coalition to Defeat ISIS ministerial at the State Department Wednesday, the US President touted the territorial gains made against the terror group. "The United States military, our coalition partners and the Syrian Democratic Forces have liberated virtually all of the territory previously held by ISIS in Syria and Iraq. It should be formally announced sometime probably next week that we will have 100% of the caliphate," he said before cautioning that he wants "to wait for the official word." Trump told the audience of representatives from the 79 members of the coalition that the US "(looks) forward to giving our brave warriors in Syria a warm welcome back home" -- his most direct reference to his announcement in December that the US would pull its forces from Syria. That unexpected announcement prompted the resignation of Defense Secretary James Mattis and the special presidential envoy to the global coalition, Brett McGurk. The conditions and logistics of the US withdrawal remain under negotiation. "Rest assured we will do what it takes to defeat every ounce and every last person within the ISIS madness and defend our people from terrorism," Trump said Wednesday, calling the fight against terrorism a shared one. "The struggle against terrorism is a shared fight. We do it together," Trump said. "Everyone must do their part and contribute their fair share." Trump specifically praised Germany, Saudi Arabia and the UAE for their financial commitments to the fight against ISIS.